When divided into six ramekins, portions are definitely on the starter/lunch size. When I make root vegetable crumble for dinner, I serve it with lots of steamed vegetables or a big green salad. I’ve also made it in a shallow casserole dish. The recipe is adapted from Jane Lawson’s Snowflakes and Schnapps, a collection of cold weather dishes from northern Europe. Her root vegetable crumble includes 100g of pancetta, which she fries before adding the onion. It’s nice that way too, but I prefer the vegetarian version. Preheat the oven to 375°F (190°C). Grease a shallow casserole dish or six ramekins. Half fill a medium saucepan with water and bring to the boil. Add the carrots, celeriac, parsnip and sweet potato and simmer for five minutes. Drain, reserving 200ml of the cooking liquid. Melt a tablespoon of butter in a saucepan over a medium flame. Add the onion whites and bay leaf, and cook until the onion is softened. Set aside. In a small saucepan over a low flame, melt the remaining tablespoon of butter. Add the flour, stirring to make a roux. Gradually add the cooking liquid, followed by the crème fraiche, garlic and nutmeg. Remove from the heat and stir in the cooked onions and green onions. Season with salt and pepper, then transfer the mixture to the prepared casserole or ramekins. To make the crumble topping, rub the butter and flour together using the tips of your fingers. Stir in the ground almonds, Parmesan and rosemary. Scatter the topping over the vegetable mixture. Arrange the crumble(s) on a baking sheet and cook for about half an hour, or until golden and bubbling. mmmm celeriac.. i must try this recipe! 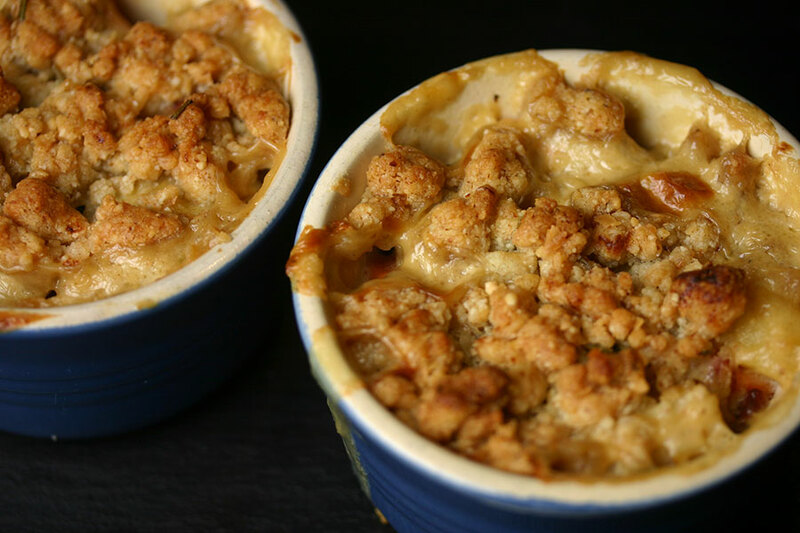 Love the crumble topping idea, something to try out! Sounds absolutely lovely! I love presence of celeriac in it. Thank you, Andrea, for another great idea! Can’t wait to report that I’ve just polished a plate of this delicious crumble and I’m gonna have more! Another success! That’s a lovely seasonal recipe! Sounds yummy!